People with Alzheimer’s are often recommended having the right and nutritious diet and enough exercise for their daily routine. Logically, the aforementioned factors are completely relative because of our biological and medical differences. Nevertheless, there are two more other factors that can be revealed and fully described for you today. Bradford Place, a trusted assisted living facility in Benchmark Court Swansea IL, sees mental and social engagement are very important especially for elders with Alzheimer’s and other forms of Dementia. At this point of their lives, they often stop from doing activities that can actually challenge their minds and gradually reduce on spending time with other people, when in fact, this is the point where they are more mentally and socially engaged. Indeed, these aspects are often underdiagnosed thinking that your elderly loved ones with Alzheimer’s need focus in charging against the symptoms of the condition. However, our experts believe that mental and social engagement for them are effective coping strategies that can help them lessen or even reverse the effects of the symptoms of these memory problems. 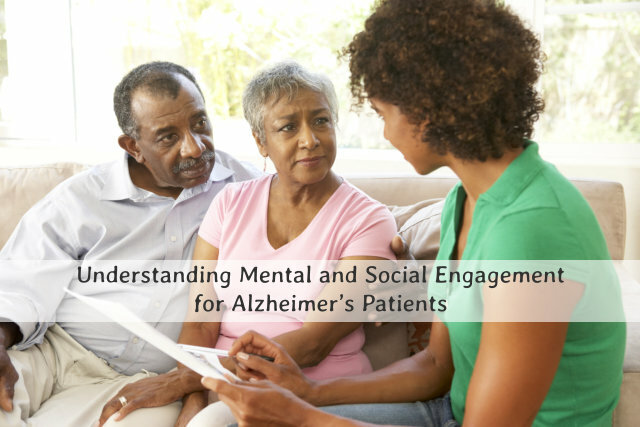 Since we are in the context of the global and advanced era, we believe that you or your elders can still do something efficient with mental and social engagement. You can play games over the Internet, of course, with the supervision and guidance of a family caregiver or professional healthcare companion. Also, you can use social networks such as Facebook or Skype to be able to talk with your family members while they are away. In this manner, you can reach out to them without having the need for them to always be physically around. Of course, other sources include the phone or email as your way of communication. We believe that older adults with Alzheimer’s can join support social groups that could understand their situation better. These groups often talk about experiences related to the condition. Having someone to actually understand your situation can make you feel better which reduces anxiety, isolation, and depression. A club or social group can be your way of releasing all the tension knowing that the circle you are in are ready to listen. You can also take group classes in a gym or a community college for you to be able to socialize and at the same time do some exercise. Even if you have already retired from work, it would be best for you to keep your network of support—your friends, colleagues, and even neighbors. We are social human beings; we are born to connect and relate to other people and without this aspect, it can be very frustrating and can lead to serious ailments such as depression. However, never achieve quantity for quality. This means that having a lot of friends does not entail happiness. Before your memory problems worsen, you have to make friends that you can really trust. Having a support network can help report the signs and progress of your condition. They may not always be there for you but you or your family members can ask them to check up on you once in a while. Plus, you can meet up with them if you want to. Do not let Alzheimer’s or other forms of dementia impede you from having friends and networks who can at the same time support you with your condition. Older age is actually the time you should make more friends and spend time with them as much as you can. As for mental engagement, most older people who have chosen to stay committed to sharpening their minds enjoys strategic games, riddles, puzzles, and other mind games. Brain teasers such as board games, cards, and crossword puzzles can already be of great help for your brain. You allow your brain to memorize or familiarize the once-forgotten vocabulary and images. You can also try the 5Ws list kind of strategy. Capturing the visuals in your head and remembering the persons involved, places and dates it happened can sharpen your mind. Learn more on how you or your elderly loved ones stay sharp and active today! Call Bradford Place, a reliable assisted living facility in Benchmark Court Swansea IL! This entry was posted in assisted living and tagged Alzheimer's Care Options, care services, health care, home care, personal care, Sign of Alzheimer's. Bookmark the permalink.